JP, the acronym of Jeungpyeong, was used as a motif to evoke an image of the county to the beholders. 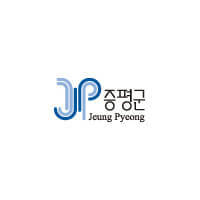 “JP” was designed to be comprised of several characters as a way to present the diverse sides and abundant potential of Jeungpyeong in a dynamic and organic manner, and to portray the various dreams, hopes and purity of the citizens of Jeungpyeong-gun. Hanbyeori, the mascot of Jeungpyeong-gun, was inspired by the bright stars in the night sky that cannot be commonly seen in metropolitan cities, and this concept brings attention to the fact that Jeungpyeong-gun has a clean natural environment. The ginseng fruit in his right hand emphasizes the status of Jeungpyeong as a major producer of ginseng. A bicycle was designed using the Korean characters for “Jeungpyeong.” It is the perfect symbol of Jeungpyeong, a “biking county,” which contains a 12km bike road along the embankment of the Samgicheon Stream that traverses the county and the 20km MTB trail and hosts a national mountain biking competition. The magnolia is an exquisite flower that breaks the news of the arrival of spring. It represents purity, harmony, and gentleness, and symbolizes the hopeful citizens, love of nature, and prosperity. Ginkgo trees, which exhibit clearly defined sexual dimorphism, symbolize discernment and etiquette, liveliness, and cleanliness that cannot be tainted under any circumstances. Egrets inhabit green mountains with clean, unpolluted water. When they are sighted, it is believed that an abundant harvest awaits. These birds symbolize prosperity and their presence is a sign of clean environment.